Woo hoo! A new ing song is done and now available for your listening pleasure. 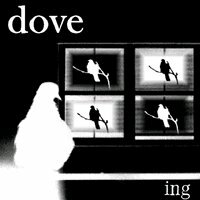 It is called "Dove" and is possibly our most fully realized sound yet (strings! choirs! handclaps!). We could not have done it without the help of special friends (literally) across the country who helped on it. A new video for Dove (which we made ourselves -- thank you Mr. Jobs!) is also live on YouTube (see Sound and Vision link at your right). And there is much more to come. Thank you all for your support and encouragement.